Following his term as governor, John Stelle played a crucial role in the design and passage of the Servicemen's Readjustment Act of 1944, better known as the G.I. Bill of Rights, which ranks among the most progressive and beneficial laws enacted by any nation. 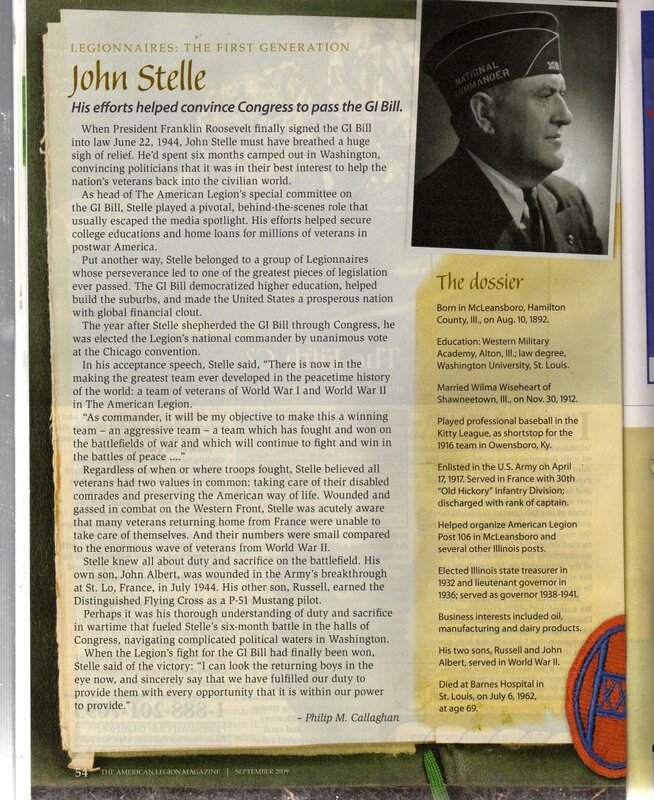 According to his citation in the James Bryant Conant Award, "Stelle, a World War I veteran and past national commander of the American Legion, quarterbacked a team of Legion officials that, in the space of just six months, designed and put forth the main features of the GI Bill, organized massive public support and shepherded its successful passage through Congress. Stelle's leadership and behind-the-scenes negotiating skills are widely credited for the legislation's surviving stubborn pockets of resistance, intense debate and a conference committee deadlock that nearly scuttled the bill at the 11th hour." Late in life, he was a stalwart supporter of John F. Kennedy during his 1960 campaign for President of the United States, and assisted in forming a coalition of supporters from central Illinois. Kennedy, from personal accounts, credited that coalition with helping him win that pivotal state (by a narrow 11,000 vote margin). In 2002, Stelle won the James Bryant Conant Award posthumously by the Education Commission of the States.